The tragic death of Vivienne McKenzie by a tiger at Laohu Valley is regrettable and I send my sincere condolences to Vivienne’s friends, family and colleagues. Vivienne gave years of her life to tiger conservation. Vivienne’s accident and my accident with Corbett occurred with tigers in bomas. I don’t believe this is a co-incidence. Some of the most magical times of my life have been spent in the company of tigers that have come from captivity. Ron and Julie came from a zoo in Canada, Sundarban, Shine and Zaria were abandoned at birth and hand raised. Khumba and Aurora were purchased as cubs from an animal dealer. Thankfully all of these ended up as wild and free tigers. Once you enclose the tiger and prevent it from a free and natural existence, the partnership with that tiger ends. Corbett was born wild and grew up wild. In 2011 during the devastating floods, Corbett’s fence was washed away. Seatao bigger and stronger than Corbett, entered the area where Corbett was wild and nearly killed him in a fight. To save his life and protect him, I put Corbett in a boma. In that act I took away his freedom. I removed his potential to be a wild tiger. My intensions were good, the results were bad. From the moment of incarceration, Corbett hated me. I took away his territory, his ability to hunt, his challenge to defend against rival male tigers. I reduced him to a resentful, dangerous tiger. When the time came to take revenge, he did exactly that. At the recent CITES convention I wonder how many of our government officials thought for one minute about the 8,000 lions incarcerated for the canned lion and body parts industry. 8,000 Lions with no criminal record are incarcerated, waiting for the day when a rifle or high powered crossbow will end their lives. The attitude is summed up by the words of our Minister of Environment when referring to Black Rhino sold to a zoo in Vietnam and I quote: “These are young animals and will adapt well to zoo conditions”. I suggest that no wild animal adapts well to zoo conditions. CITES CoP17. Thank you for many of your insightful letters to my last newsletter. While I agree with everything that you say, some thoughts towards the end are misguided… comparing RSA to Botswana… regarding rhinos. How many rhinos are there in Botswana? How many in South Africa? If you were a poacher, would you try to find the few rhinos in a desert, or 12 000 in Kruger? It is obvious that our biggest problem there is that we have so many in one place, a magnet for poachers. I also feel uncomfortable that we as humans are happy to have taken cats, dogs, chickens, turkeys, ducks, sheep, goats, horses, donkeys, cows and many more from their wild, natural habitat, and keep them in awful conditions in feedlots and abattoirs, and that for our own appetites and whims… Do we have the right to condemn farmers for farming tigers and lions when we do the same with our own livestock? That is hypocrisy. I do NOT support canned lion hunting etc. but then all of us should become vegetarians and stop farming other animals if we are really serious about the ethics of ALL ANIMALS. We humans are a cancer on our own planet. The whole issue of Elephant, Lion and Tiger survival comes down to corruption at the highest governmental level. We will not learn now or ever, the game is lost and that is a huge blight on us all. You hit hard and rightly so - too much posturing and pandering to those who think they know what’s best for our animals. Who are the EU to dictate the future and destiny of our animals? A bunch of pampered and podgy well cosseted individuals who would tour the bush in their designer civvies ….. spare me …. Time to visit Tiger Canyon again in 2017. I thought you may be interested in some news from CITES where I have just spent 2 very challenging weeks. Please take note of Eugene Lapointe’s closing address to the CITES conference. This spells out the very difficult times our African Wildlife will have in the foreseeable future. I fervently believe that unless we practice sustainable utilisation we will lose our natural heritage in Africa. I view you as a true African accentuated by the fact that you grew up in our natural environment and I am therefore disappointed to see that the anti-sustainable utilisation crowd seems to be converting you to be one of them. Bear in mind that I say this knowing that if the Animal Rightists have their way my 1,409 rhino will all be dead in 10 to 12 years time. In your project (which I admire greatly) you can remove horn on a sustainable basis. 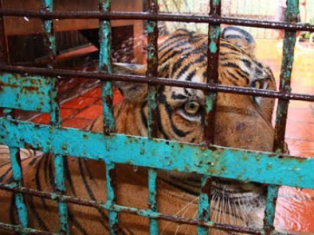 With tigers, to access the body parts, the tiger is killed. This is the fundamental difference. I was brought up on the understanding that wild life would survive under full utilization. You can catch it, hunt it, photograph it and eat it, was the mantra I was taught. In a perfect world without corruption this could work. Unfortunately we don’t live in a perfect world. Kruger National Park, the stronghold of the white rhino has lost more than 4,000 rhinos is the last 5 years. High ranking officials in including Section Rangers have been caught re handed poaching rhino in Kruger. Veterinary staff and police at Skukuza have been arrested. Well known vets have been caught supplying immobilizing drugs to rhino poachers. More than a dozen professional hunters have been charged with illegal rhino horn dealing. None have been prosecuted. Only a Vietnamese national has received a jail sentence. You are the only legal operation in a sea of corruption. On another note, I was bitterly disappointed when you gave up your investment in the Free State next to Tiger Canyons. 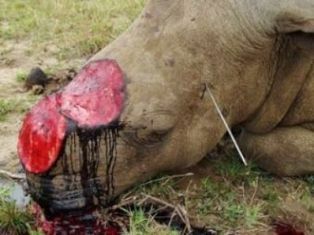 All this land has returned to sheep and the one rhino left, has been shot. We should have worked together on this for mutual benefit and the benefit of the rhino. John if I come to you with 40,000 hectares of land, game fenced, would you be prepared to let me warehouse 50 rhino for you. The rhino belong to you. I am responsible for their protection. Should I lose a rhino to poaching, I pay you the market value of the rhino. Let me know if this is of interest to you and keep up your outstanding work.